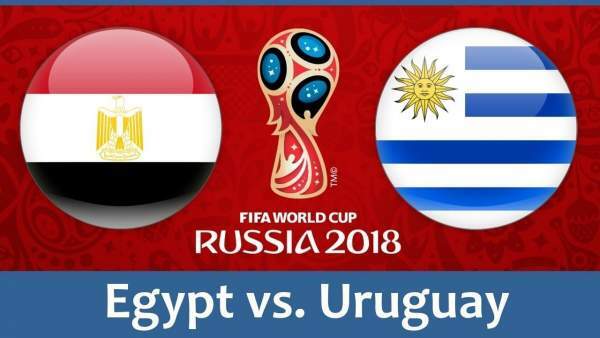 Egypt vs Uruguay live streaming will be available on the portals of official broadcasters in various countries. The FIFA World Cup 2018 has already started on June 14, Thursday with Russia and Saudi Arabia playing the tournament opening game. The host nation turned out to be victorious with 5-1. Now. it’s the day 2 and three matches will be played every day from now on. Egypt and Uruguay will both hope to start their world cup campaign on a good note. Egypt is coming back in the title race after 28 years. It’s a game between the teams of Group A at the Ekarterinburg Arena on June 15. The injury and health of star forward Mohammed Salah is a cause of concern for Egypt team. Let’s see if coach Hector Cuper allows him to play in the match or not. He got his should injured while playing for Liverpool in the Champions League final against Real Madrid. So, it has jeopardise his World Cup participation. Looking at both the teams and competition threat which posses to each other, Egypt will witness a tough, uphill fight on the ground. They haven’t played a world cup game since 1990. While, two time champions Uruguay will play for the third time in a row in the World Cup tournament. In 2010, they finished fourth and reached quarter finals since 1970 edition. They also played some good football in the World Cup 2014 but got eliminated in the second round with a 0-2 loss against Colombia. Before facing Colombia, they registered back to back victories against England and Italy. Luis Suarez, Edinson Cavani, and Diego Godin will play in their third consecutive world cup series. Their experience will matter a lot to the team. Today’s match will start at 5 pm IST, Friday. In India, the telecast will be on Sony Ten 2 / HD and Sony Ten 3 / HD. While, SonyLIV.com will live stream the game. In the UK, it will kick off at 1 pm UK time and the live broadcast will be on BBC One tv channel. Uruguay is expected to win against Egypt. Atletico Madrid duo Godin and Gimenez won’t let Egypt to spread its wings and take control of the game. While, Suarez and Cavani will have their impact at the other end.